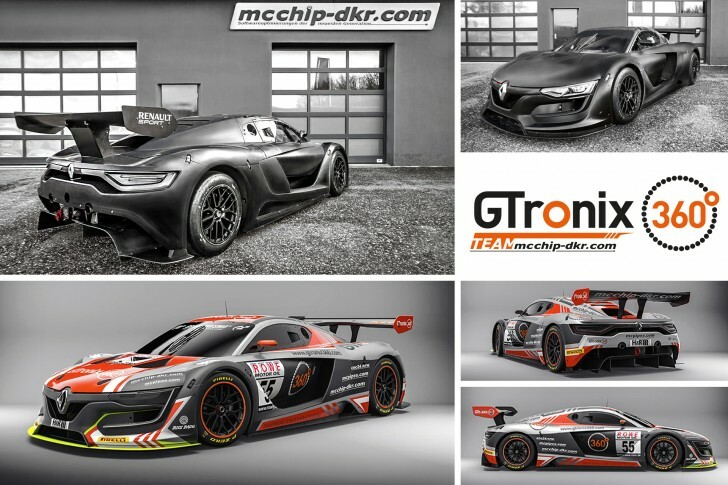 We disclose our secret – the GTronix Team mcchip-dkr participates with a Renault R.S. 01 GT3 in class SPX at the VLN and Nürburgring 24h race in 2017. A highly motivated team in conjunction with the useful insight and support of Renault Sport, tire partner Pirelli and multi-oil manufacturer GTronix forming an ideal basis for this project. The experienced drivers Heiko Hammel and Dieter Schmidtmann will share the cockpit. The other drivers will be announced shortly. The comprehensive planning for this project has been underway since October 2016. Overall, there was not much time for our team to familiarize themselves with the new vehicle and the conversion for using it on the demanding Nordschleife. The SPX regulations also required many adjustments to the vehicle. Through the companies mcchip-dkr engineering and mcpipes, which were newly founded by mcchip-dkr, all changes can be developed and conducted in-house. From CAD design to welding work our manufacturing of special parts. The project is a technical challenge for all departments and offers the opportunity to gain important knowledge in the automotive sector. We are looking forward to an exciting motorsport season and hope to refresh the VLN starting field with the Renault R.S. 01 GT3. First test runs on the Misano World Circuit will be held this week.